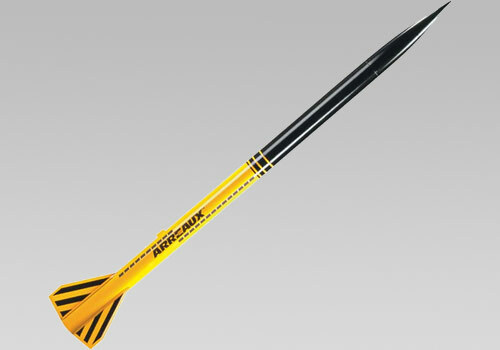 Aerotech trademark rocket. Pronounced "aero," the Arreaux's payload section makes it perfect for lofting altimeters, accelerometers, and other experimental projects. With G powered flights approaching 3000 feet, this rocket cranks! AeroTech model rockets are not your average rocket kit. The large size, sleek aerodynamics and adult styling will single out AeroTech rockets as something special. But, the real revolution is on the inside! When you take a look at the included components, that's when you will see the difference. With features that include large, colorful, self adhesive decals, adapters that allow the use of various sizes of AeroTech motors, and strong, light Aero-Fiber centering rings, AeroTech is the obvious choice for anyone looking to discover how much fun big rockets can be. This kit includes 29mm aluminium motor retainer, which makes assembly much easier. Add 29 to 24mm adapter if you want to launch this rocket with 24mm rocket motors. Designed for E through G composite hobby rocket motors. No more Wadding! Labyrinth ejection gas cooling system.